This is called the Condor Country Tour because it travels back and forth across the Los Padres National Forest, the last refuge of the great California Condor. You may not see any of these rarest of raptors while riding here, but you will enjoy a scenic feast at nearly every turn, from high, dry chaparral to lush, green canyons…from ridge-running panoramas high above the ocean to rolling, vineyard-covered hills. The tour explores remote canyons in the Los Angeles National Forest before climbing over Tejon Pass and descending into beautiful Lockwood Valley. 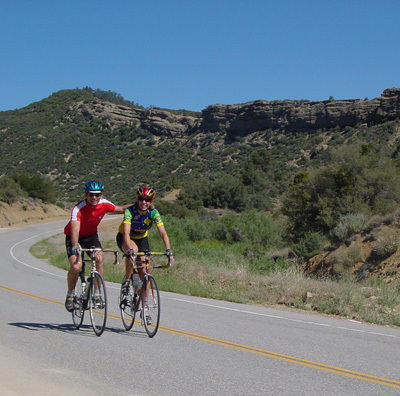 After crossing Pine Mountain summit, the route follows scenic Hwy 33 down Wheeler Gorge to the town of Ojai and Lake Casitas. It visits the posh enclave of Montecito and then climbs Rattlesnake Canyon to the well-named Camino Cielo on the way to an overnight in Paradise on the wild Santa Ynez River, in the hills below San Marcos Pass. From Paradise, the route descends past Lake Cachuma into the peaceful Santa Ynez Valley, a region justly famed as a great cycling destination. This valley will be the staging area for the final three days of the tour, offering either easy, rolling rides among the vineyards and ranches on the valley floor, or alternatively, presenting more ambitious riders with some really challenging and extremely remote and scenic mountain routes. In addition to the cycling, there will be opportunities for sightseeing on foot in the quaint Danish village of Solvang, as well as hiking to waterfalls and swimming holes. Although it is not designed as a loop route, it can be made into one with some modification to the beginning and end of the tour. This will result in a route that is slightly less enjoyable (in my opinion). But if you need to plan for leaving cars at the start for your return, it can be done. Details for how to do this are discussed in the information packet. 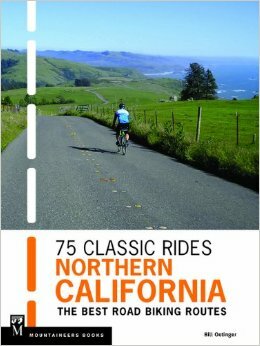 This tour shares some roads and overnights with both the Mid-State Tour and the Solvang Mini-Tour. A loop exploring San Francisquito Canyon, Bouquet Canyon, and Spunky Canyon, with a shorter option that explores Leona Valley. A good ride, but not a great ride, and as it is a loop from camp, it could be skipped if you’re pressed for time. But it does have its charms and is worth doing. Begins east of I-5 in the Sawmill and Liebre Mountains. Rolls gently up the valley made by the San Andreas Fault and then climbs more steeply in a gorgeous, remote canyon before descending to a rolling run up through Gorman, crossing I-5 near the top of the Grapevine at Tejon pass. Climbs steadily to Lake of the Woods and then explores Lockwood Valley. Beautiful, wide open spaces, tall forests, and long, sinuous downhills, including descending well-known Heartbreak Hill. Home to eagles, condors, bobcats, and cougars. Camp at either Reyes Creek or Camp Scheideck, side-by-side camps (one a forest service camp, the other an old, private resort). Showers, creek access. Up and over Pine Mountain summit and down the canyon of Sespe Creek along scenic Hwy 33…mile after mile of gentle downhill and glorious scenery. Then a brief climb and more downhill through ruggedly spectacular Wheeler Gorge. A brief visit to the charming town of Ojai and an overnight on the shore of the lake. Showers, lake access. One of the more incredible bike rides you’ll ever do. Start with climbs over the twin summits of East and West Casitas Passes, then work your way through the town of Carpenteria and the exclusive, luxurious retreat of Montecito. Then climb Gibraltor Road to Camino Cielo: a cliff-hanging, switch-backing, ridge-running adventure of the highest order. After miles and miles of eye-popping panoramas over Santa Barbara and the Pacific, you drop down the inland side of the mountains to the headwaters of the Santa Ynez River. No showers in camp, but easy access to several wonderful swimming holes. The short route is a very simple, very pleasant cruise down out of the mountains, past Lake Cachuma, and around the vineyards and horse ranches of the Santa Ynez Valley. Short-course miles can—and should—be bulked up with the optional out-&-back in Happy Canyon. The long route is a real walk on the wild side: a very steep climb to Figueroa Mountain and then a wild descent back into the valley. Riders on both routes can spend some time exploring the faux-Danish village of Solvang before moving on to the overnight at a private resort in Buellton. Showers, swimming pool, spas, and all conveniences. A ride in two parts (or four, if you consider the return trip): a long, nearly level run along the length of the valley of the Santa Ynez River and then an up-and-down hill-fest along Jalama Road, leading out to Jalama Beach, one of the more remote and unvisited spots on the California coast. Expect headwinds and tailwinds in equal measure and some really enjoyable downhills on the far sides of the many moderate climbs in the coastal hills. Some alternate route options are discussed. The essential Santa Ynez Valley ride. An exploration of Drum Canyon, Cat Canyon, Foxen Canyon, and Ballard Canyon. Each is special in its own way, and together they make for one of the nicest days of cycling on this or any other tour. A few challenging climbs, but mostly just rolling hills through peaceful, oak studded meadows and vineyards. Camp again in Buellton or head for home after the ride.